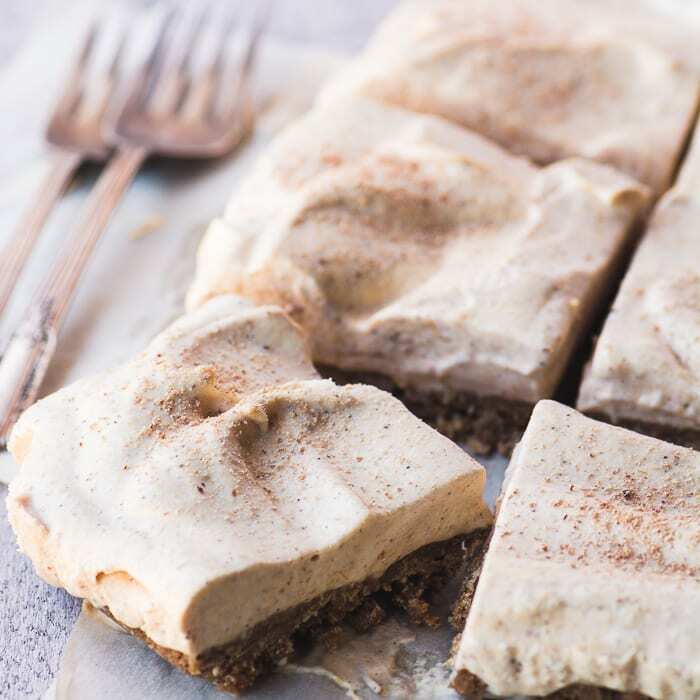 No Bake Pumpkin Cloud Bars ~ this whisper light pumpkin dessert with its spiced graham crust and fluffy pumpkin topping is perfect after a heavy meal! 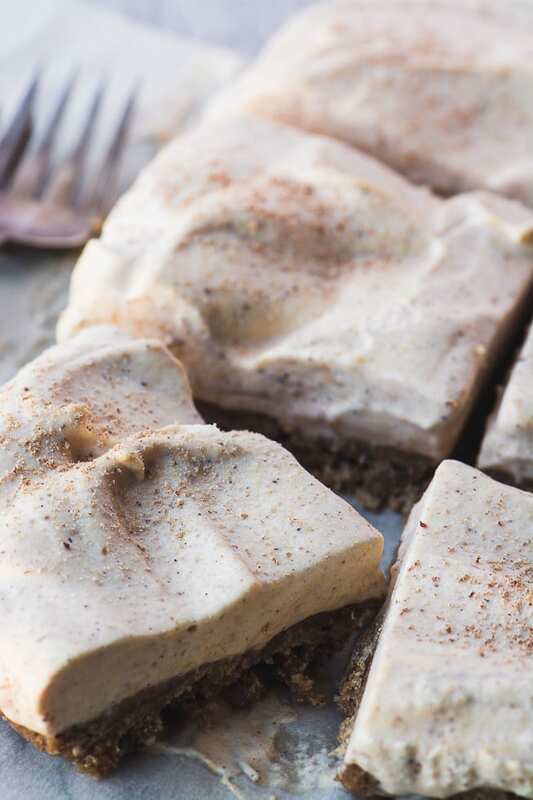 These No Bake Pumpkin Cloud Bars are patterned after my beloved LEMON CRUNCH BARS. Those bars sustained me through a long hot LA summer with their easygoing, vintage charm and I loved them so much that I find myself reinventing them again and again as the seasons change. This latest reincarnation is inspired by my favorite fall flavors, and it gave a me a great excuse to make yet one more pumpkin treat. 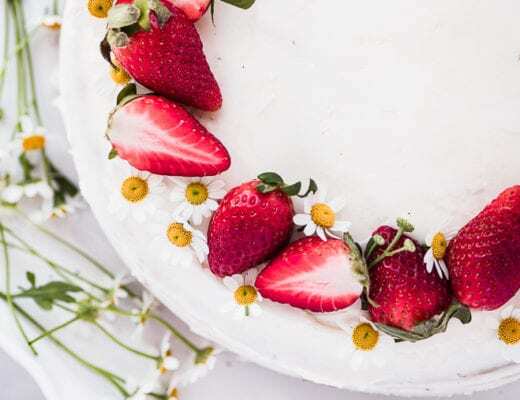 Holiday desserts tend to be on the heavy side. 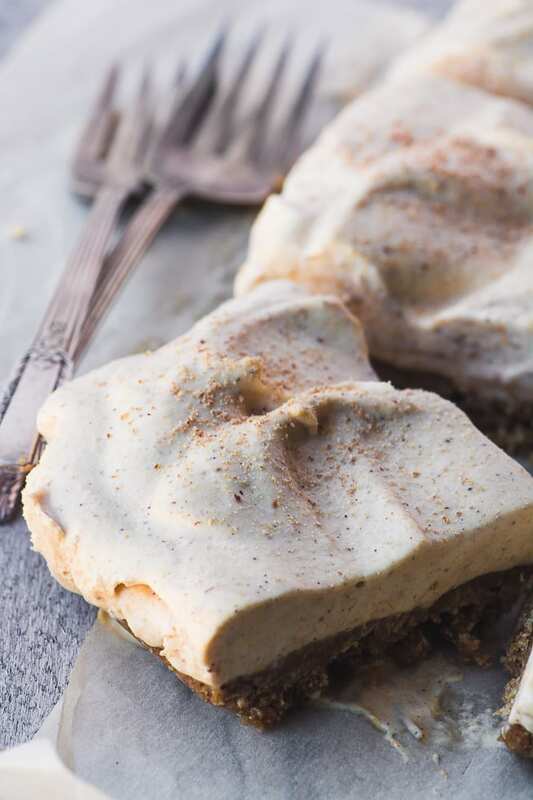 But let’s face it, no one really wants a heavy dessert after a big meal, and that’s where these Pumpkin Cloud Bars come in. They’re creamy and refreshing, but practically weightless. They have a gently spiced pumpkin flavor and the texture of whipped cream. I added cinnamon, nutmeg, cloves, allspice, cardamom and ginger to both the graham cracker crumb crust and the filling so you’d be sure to get the message! These bars are best served chilled, and you can even eat them straight from the freezer. TIP: Cutting is easier if you freeze the bars for an hour before slicing. Spray and line a 9x9 square baking dish with parchment paper with long ends. The paper is completely optional, but I find it helps me lift the chilled bars out for neater cutting. Put the graham crackers into the bowl of a food processor, crushing them as you add them. Sprinkle in the spices and sugar and process until the crumbs are all evenly crushed. Add the melted butter and process until the crumbs are all dampened. Press the crumbs into the bottom of the pan, using gently pressure to get them evenly packed down. Rinse and dry the processor bowl and blade and add the cream. Process until the cream is whipped to stiff peaks. This takes only about 30 seconds, so watch carefully. Then process in the pumpkin, condensed milk, and spices, just until blended. Turn the whipped filled out onto the crust and spread out evenly. Refrigerate until firm, about 6-8 hours. Cut into squares and dust with freshly grated nutmeg. You can also use gingersnap or chocolate wafer cookie crumbs if you like. 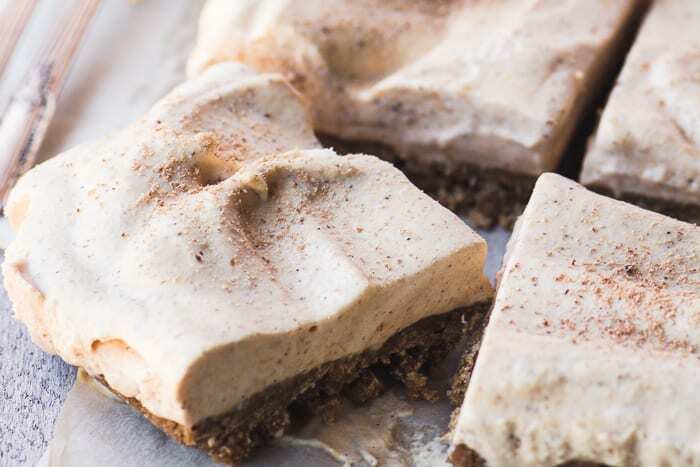 don’t forget to pin these no-bake pumpkin cloud bars! What dreamy bars, I love that cloud-like topping! These look amazing! I’m going to surprise my son with these pumpkin bars this weekend. 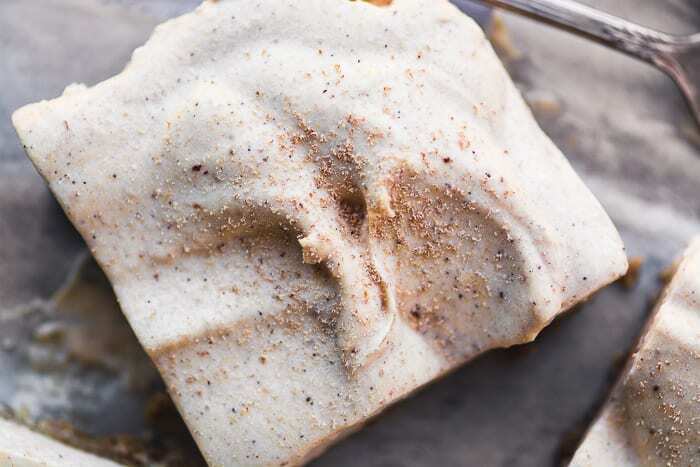 This looks a lovely recipe and would love to make it but as I don’t know what Graham Crackers look like, could you give me an idea of either volume or weight please. I know this sounds strange but I live in New Zealand. Thankyou. ? Thanks Sue, Ginger Snaps would be a good combination with the Pumpkin. I can just see all those wonderful spices peaking out of the crust and filling. 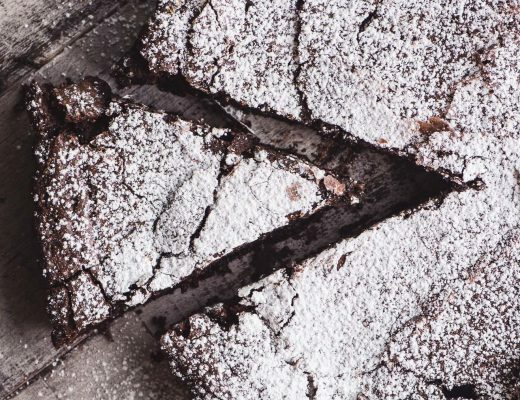 This is another one of your amazing one pan drool worthy desserts! I guess I’ll have to buy more pumpkin! My family is going to flip for this. It’s becoming an annual tradition to make a TVFGI dessert for Thanksgiving :) Last year we made and devoured your Frozen Turkey! Oh gosh, I could use a Frozen Turkey right now, thanks Tricia! I have never made a cloud type bar but they look so light and refreshing. You are right that nobody wants a heavy dessert after stuffing their faces with turkey and the trimmings. These look like they’d be a big hit at my holiday table. Have a great weekend Sue! Has anyone tried these? I see comments but it doesn’t sound like anyone made them. I’d like a review if someone out there made them! Thanks ? This post is new today, Darlene, but you might take a look at some of the other variations, like the Lemon Crunch Bars that have been on the blog longer. This is perfect Sue for the holiday! We love no bake deserts and no bake bars like these light ,and fluffy and the crust sounds just as delicious as te pumpkin layer on top. These look so light and heavenly! I’d have to skip the cardamom (I’m allergic) but I really want to try these. Nice job, Sue! Pinning. 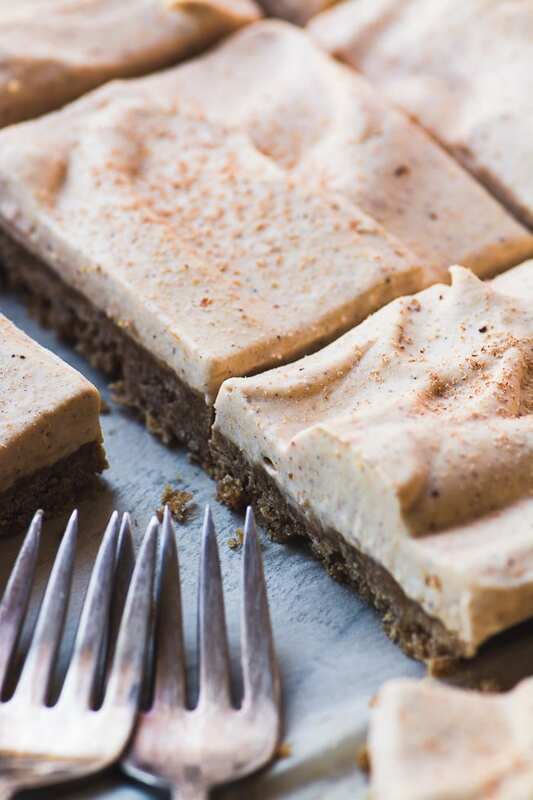 These look like such a delicious alternative to the traditional pumpkin pie square. 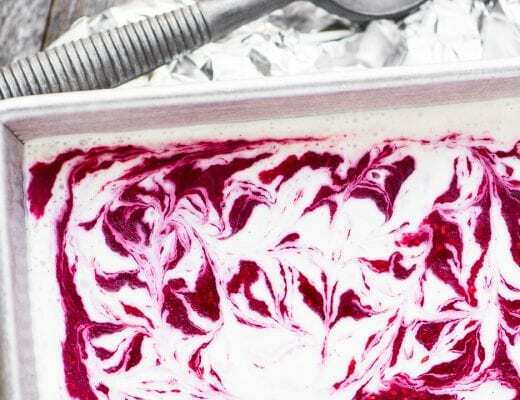 I love how light and fluffy sweetened condensed milk and whipping cream is when combined – I use this method to make ice cream in the summer. But pumpkin – I love it any time of the year! I’ve discovered that combo in a big way this year, and, yes, I do no churn ice creams with it as well! Love no baked desserts, Sue – and this one looks perfect for Thanksgiving! I like that they seem lighter than the typical pumpkin pie. Oh my! These look so yummy! I love that they are no bake! This looks heavenly and I might be able to trick my husband to eat some pumpkins this way…awesome! I think so Angie, the flavor is so mild compared to pumpkin pie. Move over pumpkin pie! These look amazing. They would be so perfect for after a heavy holiday meal! How much butter is in the crust?